It’s that time of year again. Adrenaline, excitement, anguish, depression, lethargy, and resignation: these are all common feelings associated with this time. What is so significant about this particular time of year you may ask? Well, now is the time of year when the season finale of the Game of Thrones has come and gone. A whole 9 months to go before we find out who the next unsuspecting victim(s) of George R.R. Martin’s vicious pen will be. And I ask you: how are we supposed to deal with that? Sure, for the next month, there will be lots of debate about what might happen and who may become the next strongest contender for the Iron Throne (seriously people, don’t keep bandying Daenerys Targaryen’s name about so much… Martin may get angry, and then BAM, there goes one of our favourites!). Some people may even pick up the books for the first time, in an eager bid to get ahead of the TV show (to the person who recently said to me: “why bother reading the books when you have the TV show?”, Shame on you!!! ), and yet, as someone who has read the books, and first picked them up nearly ten years ago… they will hook you, and then leave you in a worse state than the TV show. Because believe me, with the televised version, 9 months is nothing. When you wait YEARS for the next book to come out, then you will understand the true meaning of patience. However, I digress. Eventually, the hype will die down, the shock of the last two episodes will fade, and your brain will start treating the events of the GoT as distant memories: and you will detach yourself from the fantasy world in which you were so deeply enveloped. This, my friends, will last for a gestation period of 9 months… and then it will begin all over again! Frankly, for the most die-hard fans out there, it might be preferable to have a baby during that time (literally) than to have to cope with forming scarily strong attachments to characters, only to see them be torn apart by the combined vengeful forces that are George R.R. Martin and HBO! 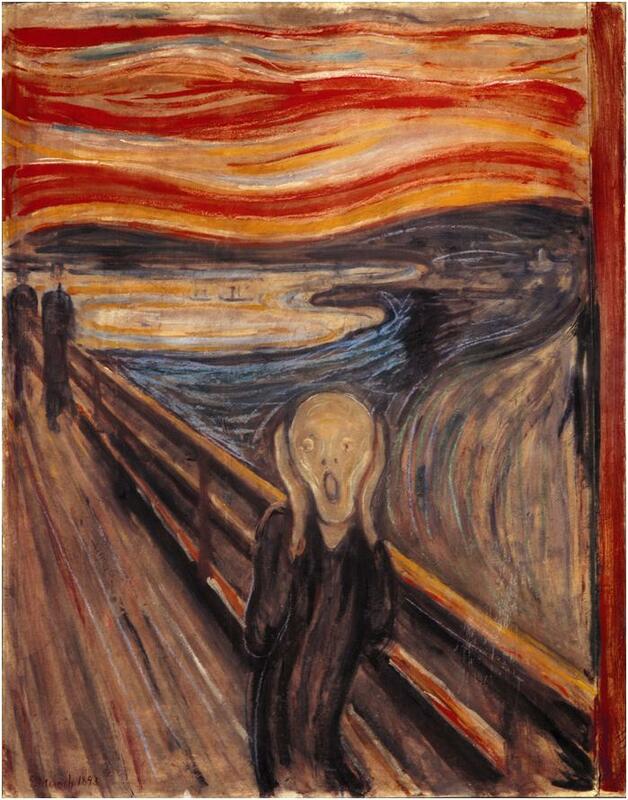 I would like to close this article by drawing your attention to how scarily accurate Edvard Munch’s prediction of the reactions to Season 3, Episode 9 (The Red Wedding/The Rains of Castamere) was with his 1893 painting of The Scream! Tempera and pastel on cardboard, 91 x 73.5 cm. To see more of Edvard Munch’s groundbreaking work, you need go no further than Washinton, D.C.’s National Gallery of Art and the Edvard Munch: A 150th Anniversary Tribute exhibition, which is ongoing until the 28th July. Who knows, you may even discover another Cassandra-esque painting for the next season! To peruse the Norwegian artistic legend that is Munch, at leisure, pick up a copy of Elizabeth Ingles’ Munch. Previous Entry ¿Quién eres, David Bowie?